Many of the tasks we do actually require prerequisite tasks (or, to make that a little more street, and you gotta do thing one before you do thing two, cabron). I was talking to a client about her process, and we talked about the importance of her desk being clean (thematic upshot, your desk is a focusing tool, not for storing papers – if you’re blocked creatively, clean your desk). I thought the topic might make for a good blog, so I took some notes and put them in my trusted system. Later, when I sat down to write, I recalled that there was a cool quote from Anthony Bourdain’s kitchen confidential that I wanted to use, but which I didn’t have readily available. The blog would have to wait. Then I remembered that I had started this same blog three times and each time I’d hit the same stumbling block. I had an emotional attachment to the quote but I didn’t have the book. As past events are an indicator of future performance, the desk Blog won’t get written until I get that book. So I have to schedule time to get to a library or bookstore or find a way to immediately bring up tasks relevant to a location when I’m at that location. I decided to turn this example of a bad process into a teachable moment and/badly needed content for my anemic blog. 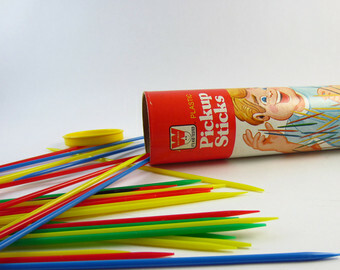 Tasks are like pickup sticks. The lesson I take is that tasks are like pickup sticks ***, and and often the task you want to do is buried under three more tasks that you’re barely aware of. So when you’re stuck, in a scene, in a process, or in life, reflect on all the steps the task requires, past present and future. Odds are, the psychology/reluctance that makes you stuck is based on a subconscious knowledge that your past self screwed your present self by skipping a step. So identity the next step and do that instead. * This blog is set in a hypothetical, better, world where pirating books isn’t an option. ** The lack of a desk Blog is holding up a grander idea I have for making a cool flow chart of how to start writing. Procrastination begets procrastination. **** I’m a little footnote happy this week because I’ve been reading/inspired by Bill Simmons. That dude loves footnotes.